This client kit contains two types of packages – Admin Package and User Package. The Admin Package intended for Certificate Authorities, Registration Authorities and other administrators who prepare and initialize the smart card/token for PKI use. Once CryptoMate Nano has been initialized, the token can be distributed to end users. 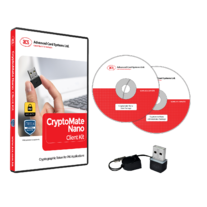 The User Package on the other hand is intended for end users who will use CryptoMate Nano for PKI applications, such as requesting for a digital certificate and using it to sign documents.